The author has spun a new fabric with Nalini’s life as a warp and her stories within the story as weft. The book defines true reality, but the effect of the stories will be based rather on one’s perceptions, impressions and experiences than on general understanding and social system. Life is not a series of gig lamps symmetrically arranged; life is a luminous halo, a semi-transparent envelop surrounding us from the beginning of consciousness to the end. Rajesh Iyer has conveyed this varying, this unknown and uncircumscribed spirit, whatever aberration or complexity it may display, with as little mixture of the alien and external as possible. Here an unseen halo surrounds Nalini the protagonist, something that cannot be defined exactly, neither can it be circumscribed by the materialistic, everyday life. This ‘halo’, the actual true reality can be comprehended by everyone, individually in a different manner. The constant companion to Nalini’s journey, which starts from the village Govindapuram (popular due to its association with Bodhendra Saraswathi a 17th-century Hindu pontiff and the 60th Jagathguru of the Kanchi Matha, who spent his later life there) to Raipur after her marriage is her stories. Born with a divine power of narrating stories for every occasion, Nalini’s stories are myriad impressions of visual, auditory, physical, associative and subliminal—that impinge on the consciousness of an individual and form part of his awareness along with the trend of his rational thoughts. The stories form a fascinating potpourri of the folktale, sci-fi, suspense, philosophy and spirituality. From the story of the elephant who steals, which Nalini tells when she is just two and half years of age to the story of the creative spider to the story of omnipresent Lord Krishna to the twist in the end tale of heist to the sci-fi swan song she narrates when she’s crossed ninety, Nalini leaves behind a spellbound audience… and not just humans. There are spiders, crows and even unseen scratching sound that emanate from the walls of her bedroom. It’s like nature is responding to her stories; a testimony to the fact that human emotions draw its essence from nature. Despite nature responding with appreciation, there are discording notes from humans: be it her monosyllabic husband, her rebellious daughter or her cousin, Vaidehi, the last leading to much bad blood, which would eventually entangle Nalini’s life in the most avoidable manner. 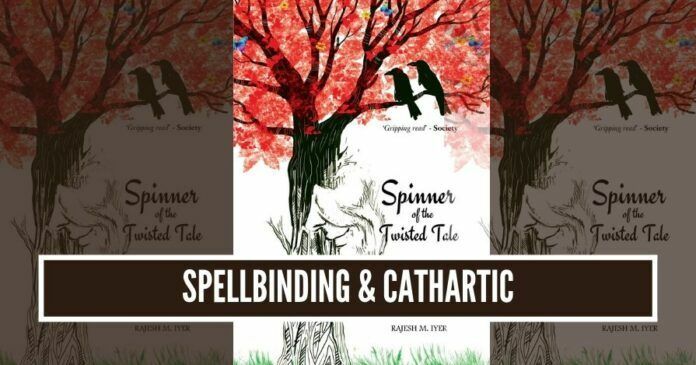 Weaving many stories within the main story, Spinner of the Twisted Tale is a peep into the enchanting world of a storyteller who depicts different facets of life not leaving the inflection point too thereby subtly describing the curve of life that goes from one phase to another. The stories form a fascinating potpourri of the folktale, sci-fi, suspense, philosophy and spirituality. The author has spun a new fabric with Nalini’s life as a warp and her stories within the story as weft. A possible sequel to the book with Nalini’s French daughter-in-law, Sophie’s child extending the chain of storytelling will be a true treat to the readers. It’s hard to describe this book in one or two words, but choosing ‘spellbinding’ and ’cathartic’ to explain this magnificent story won’t be off the mark.